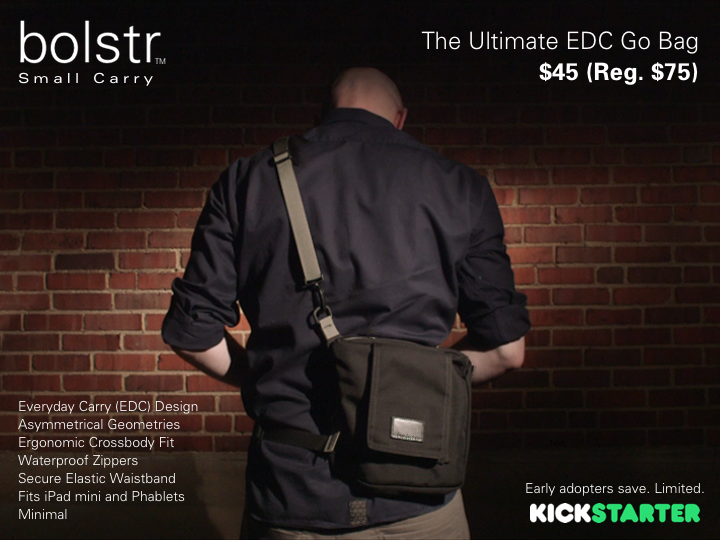 Now reading: bolstr - The Ultimate EDC Bag. Minimal and Perfectly Sized. bolstr - The Ultimate EDC Bag. Minimal and Perfectly Sized. Unsatisfied with other options available on the market, I set out to design a minimal, man-sized, everyday carry go bag, somewhere between a laptop bag and a holster. After two years of prototyping and testing, the bolstr brand is ready to go. I just launched this project on Kickstarter and wanted to give Koyono’s loyalists the first opportunity to back my project and save 40% ($45 for one bolstr - limited quantities). 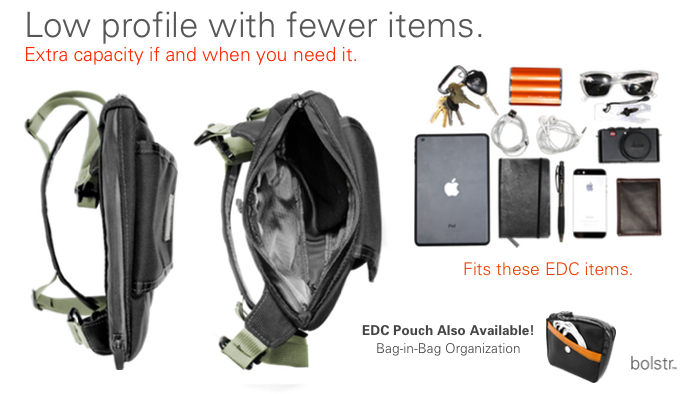 If you need just a few extra pockets for your everyday carry, and are looking for the perfect “go bag” to bolstr your "stuff," then be sure to check out my project. Click here for more details. "Cool bag. I'm glad I backed it. It really does fill a need. I've been looking for something like this but everything is too small, too tactical, too big, or a purse." - Devan J. "EXACTLY what I need and I've been hunting for just such a bag since January!" - Vincent W.
My project has been live for less than a day and we are already getting close to being 50% funded. Don't miss out. PS - Save 15% of on All Koyono.com orders. Coupon is listed below. 2014 Koyono.com All rights reserved.